Acoustic performance with design freedom. Excellence in design is achieved with a balance of aesthetics and functional performance. The Potter Interior Systems range of perforated plasterboard allows architects and designers to create beautiful ceilings and walls that achieve high levels of acoustic performance. Rigitone Range – featuring four edge to edge pattern layouts that deliver a monolithic, seamless design with exceptional acoustic performance. The Rigitone range combines functionality and aesthetics in the modern design of ceilings. Integrating lighting, ventilation systems, loudspeakers and such is straightforward and simple. 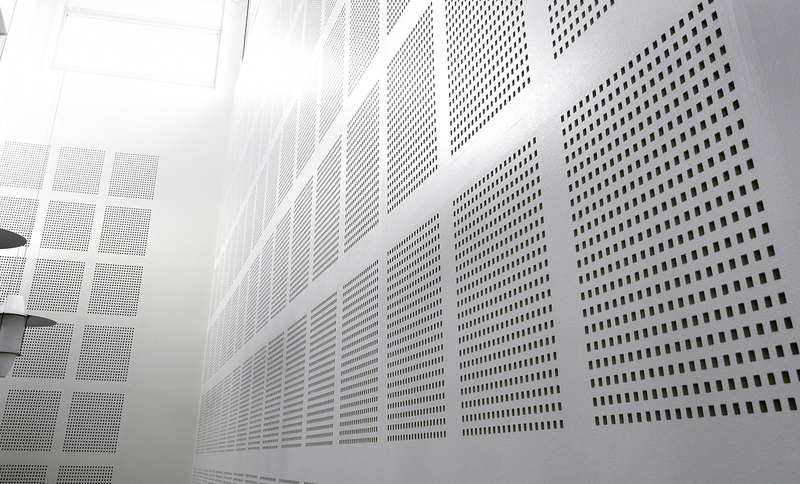 Protone Range – featuring three contemporary perforation patterns, each with different percentages of open area to meet most acoustic application requirements. Access panels are available in each of the three Protone board patterns. These provide access to the ceiling cavity while ensuring a seamless look across the surface. Gyprock Standard 6mm Round – the traditional Gyprock perforated board product that has been extensively used throughout Australia for many years – providing an economical aesthetic solution for ceilings or walls. Gyprock Standard 6mm Round is supplied without an acoustic fabric backing and acoustic performance is adequate for most situations where moderate levels of attenuation are required. See here for our full range.